This winter has had a few very cold days when the temperature was well below freezing, so I was sure everything in the garden had finally given in. Winter seemed to let up a bit last weekend, and while the mercury crept towards 50 F, I went to have a look at what must be a barren garden. I wandered over to the cabbage and broccoli I had planted too late in the season, and although the plants seemed to have a little life in them, it was barely noticeable. From there, I curiously peered at my Swiss Chard, and noticed a bunch of green. Surely I thought, this can’t still be growing ! Wrong I was, The plants are sending out new leaves from the center. 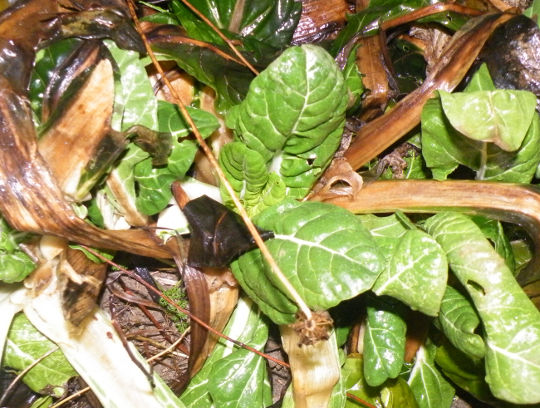 If I had harvested the small green leaves, it would have made a decent salad for a serving of four or five, however it seemed too cruel to snip off pieces of a plant which is fighting so hard to survive. I’ll wait till April, when I’ve really need a cure for Cabin Fever, and harvest the leaves then. A nice surprise for you… my garden is under a frozen tundra. Beautiful, but no green.